Known globally as African starfish flowers, and locally as carrion flowers, members of the genus Stapelia are usually characterised by their foul-smelling flowers reminiscent of the odour of rotting meat. The hairs, coloration and surface mimic decaying animal matter and attract mostly flies, which act as pollinators. The strong carrion scent is sometimes recognisable at a great distance, especially on hot afternoons. Surprisingly, species such as S. erectiflora and S. flavopurpurea have sweetly scented flowers, but they are rare. Stapelias are low, perennial succulents. The stems, their surface and branching make them immediately recognisable. The stems are almost always erect and are usually uniformly green to reddish, depending on the extent of exposure to the sun. Only rarely are they mottled with red or purple on green. The stems of a small group of species are greyish with darker purple in the grooves between the angles. Thickness of the stems varies from 5-50 mm in diameter. Tubercles on the stems are laterally flattened and vertically joined into continuous rows, rendering the stems 4-angled. Each tubercle bears a small leaf rudiment, which may vary in width from 1-6 mm. It is short-lived and leaves a round scar at the tip of the tubercle. The pubescence of the stem surface is caused by the elongation of the outer walls of the epidermal cells into slender papillae. The short papillae in some forms of S. schinzii, S. hirsuta and S. remota give the plants a glabrous and shiny appearance. The flowers are star-shaped. Large-flowered species bear their flowers usually at or near the base of the plant. The flowers of the smaller-flowered species are usually dispersed at various heights on the stems, sometimes at the base. Flowers in an inflorescence generally open in succession. The flowers are extremely variable in size (6-400 mm across), but there is usually little variation in the shape, invariably being almost flat and deeply lobed. In most species, the corolla has relatively long lobes and a small, central, united area. The surface of the corolla is characteristic. The outside is usually uniformly papillate and the inside transversely rugose (wrinkled). Two series of corona lobes are present: an outer and inner corona. The fruit (follicles) are pubescent, sometimes containing a large number of seeds. Seeds have a thin outer margin and a tuft of hairs (coma) helping with wind dispersal. In general, stapelias are never very abundant and are scattered over vast areas. In Namibia Stapelia pearsonii is listed as rare. On an interim Red Data assessment (August 2006) of the Threatened Species Programme (TSP, SANBI), 20 taxa are listed in the following IUCN categories: four Data Deficient (DD), 10 Least Concern (LC), three Near Threatened (NT) (Stapelia baylissii, S. clavicorona and S. tsomoensis ), and three Vulnerable (VU) (Stapelia obducta and both subspecies of S. praetermissa). The general threat seems to be degradation of habitat, but for most of the listed species the threats are unknown. Stapelia is native to the arid regions of tropical and southern Africa, in Botswana, Zimbabwe and especially in Namibia and South Africa where about 43 species occur. Outside this region they are also found in southern Angola, scattered in northern Zambia, southern Malawi and central Mozambique. Collections from southern Tanzania and Kenya are probably of plants that have escaped from cultivation. Plants are found in nearly all habitats, but mostly in well-drained soils in the drier regions. In South Africa they are widely distributed, but concentrated around the mountainous edge of the country. It is absent from the sandy central parts of the Kalahari, the most arid areas of the Namib and the wetter, higher parts of the Drakensberg. 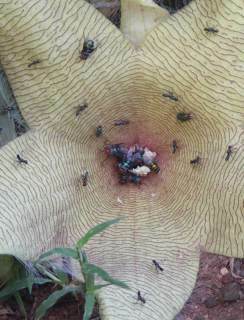 Stapelia contains a number of very localised endemics such as S. clavicorona and S. remota. The name Stapelia was introduced by Linnaeus who described it in 1737. The name honours Johannes van Stapel, a 17th century physician and botanist. Members of this strictly entomophilous (strongly associated with insects) genus occupy a wide diversity of habitats, mostly in arid areas. The putrid smell of the flowers of many species attracts flies and other insects for pollination (myophily). It has been reported that flies are sometimes so deceived by the odour that they lay their eggs around the fleshy corona, convinced that it will be a food source for their hatching larvae. The male and female parts of the flower and various membranes and sacs are fused into a complex structure which usually traps the mouthparts or legs of insects. A clip attached to two pollen sacs of the plant becomes attached to an insect in its struggle to free itself. This is deposited on the next flower visited where the pollen germinates, causes fertilisation and the development of seed. Individual flowers are mostly short-lived, but in some cases plants have extended flowering periods through the sequential formation of new ones under favourable conditions. The light seed, with its coma and wing-like margin, is adapted to wind dispersal. Most species appear to be relatively short-lived under natural conditions. They are generally widely scattered, and populations sometimes vary considerably in density over time, even disappearing from a locality where they were previously plentiful. 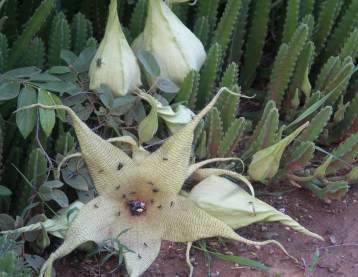 Parts of Stapelia gigantea have been reported to be used by the Zulus as a remedy for hysteria. 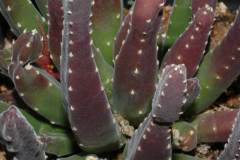 These plants are, however, mainly sought by collectors of succulent plants. Stapelias are subjects of interest rather than beauty and are frequently grown by collectors of succulents. Some large-flowered species make a good show when grown in masses in the garden. In general they are drought-resistant succulents suited for rockeries, and the small-flowered species are suitable as container plants. They are excellent subjects for a water-wise garden. The sterile stems are very attractive when planted in full sunlight. When in full flower, pollinators are attracted by the odour. For the eco-friendly gardener this is a way of attracting food for birds and reptiles such as lizards to the garden. Carrion flowers grow very easily in all parts of South Africa. They like a sunny position and will also grow in light, semishade in hot climates. The soil should have good drainage and a pH of 6.5-7.5. Most species do best in a well-drained sandy medium consisting of equal parts of washed river sand, potting soil and topsoil. Provided that they are not over-watered and are given a warm position, stapelias will flower successfully. Plants from the wetter regions should be watered more often than those originating from the drier regions. Rather water plants sparingly than excessively. The plants require a period without water in summer or winter (a dormant phase), depending on whether they come from the summer or winter rainfall area. They can survive long periods without water, but be sure to water them before they shrink too much and will not be able to recover. In nature they are mostly sheltered from the sun by the shade of thickets and shrubs or their roots escape high temperatures by growing below rocks and slabs, only exposing the stems. Stapelias are easily propagated by stem cuttings or seed. Seeds take about a year to ripen, but germinate rapidly after sowing. Fresh seeds usually germinate better. Sow seed in spring in a well-drained, light, sandy soil mixed with compost and cover with a thin layer of soil. Keep the temperature at 25-35 °C, in a shaded and fairly moist position. Keep plants well ventilated and in good light to prevent damping off. Treat the seedling medium with a fungicide, but keep in mind that some chemicals may stunt their growth. Once the seedlings have germinated and are about 50 mm high, they can be pricked out and planted (be careful not to damage the roots when pricking out). Generally the plants grow fast and most will flower within two to three years when grown from seed. Cuttings should be taken during the active growing stage to ensure good rooting, before the plants enter their dormant phase. Cuttings can flower in their first year, depending on the size of the cutting. Stapelias grow easily from cuttings as long as they are given adequate time to dry out before planting (at least two weeks). Leave the cuttings in the shade to dry out. Use a fungicide drench before planting. Place them in a well-ventilated area with about 40% shade. Water daily during very hot weather. Plants that do not grow well from cuttings can also be propagated by grafting. 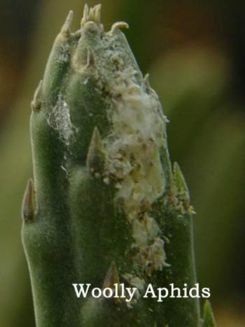 Woolly aphids on the roots and underground stems and mealy bugs on the stems and bases are the most common problems. A strong jet of water or a 50/50 mix of methylated spirits and water can be used to eradicate these pests. Black rot, a secondary infection after woolly aphid attacks, is also problematic. Remove all traces of black rot with a sterile knife, spray the plant with Benelate and dust with flowers of sulphur. As soon as stem rot is noticed, the affected parts should immediately be cut away and destroyed. Because of the many diseases to which succulent Apocynaceae (including Stapelia ) are prone, they are some of the most difficult succulents to grow. Stapelia gigantea is a very variable species with the largest flowers in the genus ranging from 100-400 mm in diameter. It is the most widely north-south distributed species and occurs in Zambia, Malawi, Mozambique, Botswana, Zimbabwe and South Africa. It grows in many habitats and may form clumps of 1-2 m in diameter. Stapelia grandiflora is probably one of the best recorded of all S. African stapeliads. It is widely but scantly distributed over the Great Karoo, Free State and southwards to Port Elizabeth, but occurs mainly in the Eastern Cape. This is one of the species with the most robust stems and may reach a height of 300 mm, with compressed angles and prominent teeth. Flower buds are typically rounded where the segments meet; the flowers are up to 150 mm in diameter, dark purple-brown, usually darker towards the tips of the segments, with long purple hairs on the disc. The lower part of the lobes is ciliate with long, simple, white hairs. It is distinguished from S. gigantea on account of distribution and the shape of the bud. It is also closely allied to S. hirsuta. Stapelia gettliffei is native to the warmer, dry, sandy parts of the Limpopo River catchments in southeastern Botswana, the northern parts of South Africa, southern Zimbabwe, and just over the border into Mozambique to the east. It usually grows in low-lying areas in shaded situations, often with other stapelias of the same localities. Stapelia gettliffei plants usually sprawl in the shade of bushes and in the open are more erect and tightly knit. Tubercles are tipped with long, narrow leaf rudiments, the largest in the genus. The stems turn red in the dry season and become paper-thin. The flowers have long pedicels facing upwards, with the corolla marked in purple lines on a cream-coloured background, and the margins and central section have hairs. Flowering occurs from December-May. The specific epithet honours George Frederick Rawson Gettliffe (1873-1948), who collected extensively in remote areas of the northern parts of South Africa. The Venda name for the species is mahushule. Stapelia kwebensis is the most widely distributed in an east-west direction, from Kaokoveld (northern Namibia, southern Angola ) through the Kalahari in Botswana, eastwards in the northernmost parts of South Africa, and in Zimbabwe. Plants usually grow in flat, rocky areas, in the open or below bushes. The stems are bright green, short-toothed with erect, prominent rudimentary leaves. Natural hybrids appear infrequently. Flowers are small, carried on short pedicels near the apex or in the middle of the stem and vary in coloration from yellow-ish to green to brown or dark red. Plants produce their evil-smelling flowers from December to May. The stems are slender and pale green, with the area between the ribs darker. The first plants were discovered on the Kwebe Hills (south of Lake Ngami ) in northern Botswana, hence the specific epithet. It is difficult to cultivate under humid and wet summer rainfall conditions. Stapelia olivacea is a South African endemic and grows amongst stones and boulders in mountainous areas of the Great Karoo (north-central Karoo and southwestern Free State). Despite its wide range, it is locally very rare and does not appear to be common anywhere today. See more info below . Stapelia olivacea flowers are small, almost flat, with white hairs along the margins. 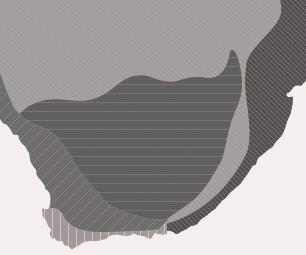 The colour is very variable. Apparently darker maroon-red flowers usually emit a strong, offensive odour of excrement, but the greenish flowers have a mushroom-like smell that is more pleasant. The stems are greyish along the flanks, with the grooves in between a darker green, sometimes purplish. The stems form attractive, neat clumps about 100 mm high. The epithet refers to the olive-green colour used in the first painting of this species. Stapelia rufa is endemic to South Africa, with populations widely scattered between Upington, Oudtshoorn, Montagu and Ladismith. It usually grows on stony, north-facing slopes, and like many stapeliads, in the protection of bushes. Plants bear small flowers, usually towards the base. The flowers are reddish to brown, the segments of the corolla narrowing into long slender points. The stems are 4-angled but somewhat round in cross section and without grooves between the flanks of the stem. This species flowers in spring. Stapelia engleriana is a South African endemic, widely distributed in the drier areas of the southwestern Karoo between Laingsburg, Beaufort West and Prince Albert. If these stapelias are sheltered by other plants, they can become up to 300 mm tall. The characteristic thick, square, prostrate to rhizomatous stems are easily identifiable. The lobes of the flowers are folded back completely, giving the flowers a round, button-shaped appearance. The flowers are purple-brown to red-maroon, about 25 mm in diameter and sometimes last for more than a week. It is generally a less attractive plant with an untidy habit due to new growth starting from points where the stem has been damaged or broken. Stapelia flavopurpurea is not a common species but is widely distributed in both Namibia and South Africa (western Karoo to the Northern Cape). Plants grow amongst stones at the base of other shrubs. The short, uniformly green stems are 4-angled and up to 100 mm tall. The star-like flowers of this striking species are deeply lobed and the margins are folded backwards, with a central disc covered in short, clavate, purple to white hairs. Flowers are borne (sometimes in clusters) near the tips of the stems and have been reported to be pleasantly scented. It superficially resembles the flowers of Tridentea virescens, the only other stapeliad that exhibits such extravagant and exotic coloration. The flowers are usually bright yellow, but various shades from yellow, green, red to brown have been reported. Although the flowers are smaller than those of most other species in the genus, they are very beautiful and lack the unpleasant smell so characteristic of most members of this genus. Stapelia unicornis is confined to the southern parts of the Lebombo Mountains in South Africa (Mpumalanga and KwaZulu-Natal), Mozambique and Swaziland. Plants grow on shallow soils, ledges and rocky outcrops. The pale green stems form stout clumps, rarely higher than 100 mm. The flowers are pale green-pinkish and about 100 mm in diameter. The centre of the flower is almost bowl-shaped. A species closely related to S. gigantea, but with smaller flowers that are decisively bowl-shaped and with different inner corona lobes. Plants are relatively easily cultivated. Stapelia leendertziae is most conspicuous when in flower owing to the unique large, bell-shaped, deep reddish to dark purple flowers that are up to 120 mm long. It is widely grown in gardens but distinctly uncommon in the wild. It occurs on the mountains of the northeastern escarpment and Swaziland where it seems to be confined to rocky ground with shallow soils. Stapelia leendertziae stems are darker and dull green compared to those of S. gigantea and S. unicornis. Flowers are produced at the base or in the lower half from new branches. This species was named after Miss Reino Leendertz, the first official botanist employed at the Transvaal Museum and who was the first to collect this species near Heidelberg in 1909. Flowering time is November-January. It is readily cultivated and can withstand a fair degree of frost. Known as aaskelk, aasklok or rooiaasblom (Afr.). Stapelia clavicorona is an endemic restricted to the northern slopes of the Soutpansberg in the Limpopo Province of South Africa. Plants grow on hot, stony slopes and consist of a few, robust stems (by far the most robust stems in the genus) that are deeply indented between the angles. Stems are olive-green and turn reddish in the dry season. Older stems become corky and white. Flowers are relatively small (50 mm in diameter). The pale pinkish green flowers are textured with club-shaped hairs along the margins of the corolla. Propagation from cuttings and seed is relatively easy. Plants flower from October-December. It was first collected in 1931 and the specific epithet refers to the club-shaped (clavate) corona lobes. Stapelia schinzii is found in Namibia and southern Angola. Three varieties are recognised, the typical one only occurring in Namibia. The plants are large and robust, and sometimes spread for up to 1 m, stems arising from a short horizontal base. The stems are mostly purple-mottled and up to 60 mm tall. Compared to the stems, the dark red to maroon flowers are relatively large (up to 120 mm in diameter). They have elongate corolla lobes, fringed with vibratile, purple, club-shaped hairs. This is the species with the largest flowers in Namibia and is closely related to the threatened S. pillansii. 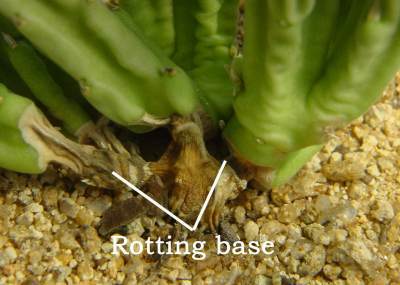 Stapelia hirsuta is widely distributed and extremely variable, with five varieties recognised by Bruyns (2005). It is found in Namaqualand and the Eastern Cape ( South Africa ) and in southern Namibia, seemingly restricted to the mainly winter rainfall areas. It is closely related to S. grandiflora. The stems are up to 200 mm high, with flowers 100-200 mm across. The flowers are cream-coloured, purple at the centre, with purplish transverse lines on the lobes which have purple-brown tips. 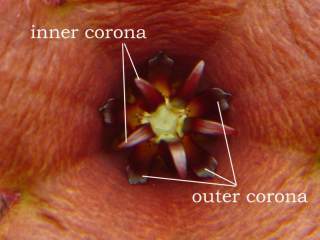 The corona, flower size, proportions of the corolla, density and texture of hairs, and details of patterning and colour, all vary within wide limits. This was the second species to be discovered and is locally known as haasoor (Afr.). Albers, F. & Meve, U. 2002. Illustrated handbook of succulent plants. Asclepiadaceae. Springer Verlag, Berlin. Bruyns, P.V. 2005. Stapeliads of southern Africa and Madagascar, vol. 1. Umdaus Press, Hatfield, Pretoria. Hardy, D. & Fabian, A. 1992. Succulents of the Transvaal. Southern Book Publishers, Halfway House, South Africa. Leach, L.C. 1985. A revision of Stapelia L. (Asclepiadaceae). Excelsa Taxonomic Series, No. 3. Aloe, Cactus and Succulent Society, Zimbabwe. Leistner, O.A. (ed.) 2000. Seeds plants of southern Africa : families and genera. Strelitzia 10. National Botanical Institute, Pretoria. Leistner, O.A. 2005. Seed plants of southern tropical Africa : families and genera. South African Botanical Diversity Network Report No. 26. SABONET, Pretoria. Is there any information or pictures for S.erectiflora?